After a fun filled girly slumber party that The Short one attended where the girls played Legos around the clock, the request came home. Here I was thinking Lego’s were for boys and I’d not have to deal with those little bitty pieces because really the Polly Pockets little pieces are enough! Well the begging began and really they are educational and The Short one loves to construct things, I guess I have to count myself lucky that the request didn’t come sooner. So we had to head out to Target and check them out, man they are really expensive – whoa! 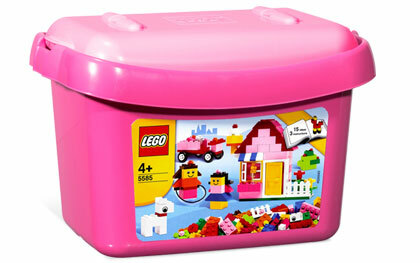 Wouldn’t you know it they have a LEGO® Pink Brick Box. It was immediately in the cart and $20 later and a trip home from the store and she was in Lego heaven. The Tall One and I also sat down with her to “help” and the uhm obsessive excited participation set in. I think we are all in trouble. I built a car and a cottage, The Tall One built a McMasion and I added a modern fireplace to it. Oh right this set belongs to the kid – Santa . . . are you reading this? Please bring more Lego’s! This entry was posted in inspiration and tagged Design, toys. Bookmark the permalink.